LipidSpot™ Dyes rapidly stains lipid droplets in live cells or fixed cells, with no wash step required. Available with green or red/far-red fluorescence. What are the cellular targets of the LipidSpot™ Lipid Droplet Stains? Intracellular lipid droplets are cytoplasmic organelles involved in the storage and regulation of lipids. 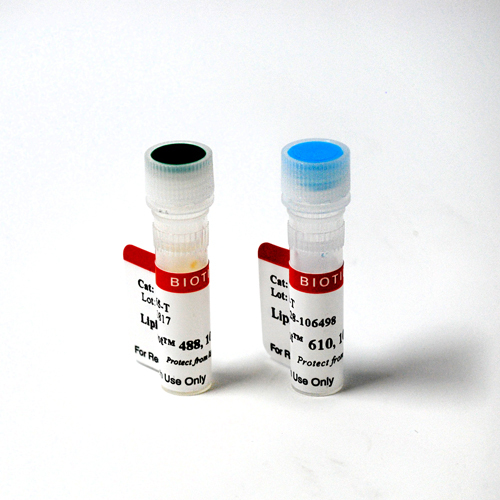 The LipidSpot™ Lipid Droplet Stains are fluorogenic neutral lipid stains that rapidly accumulate in lipid droplets. They become brightly fluorescent in the presence of neutral lipids like triglycerides and cholesterol esters. Can the LipidSpot™ Lipid Droplet Stains be used on tissue sections? LipidSpot™ stains may be used on tissue sections, but if the lipid droplets are not well-preserved in the tissue, then staining will not be optimal. Paraffin embedded sections might also not be suitable as the process of deparaffinization could result in lipid extraction. Intracellular lipid droplets are cytoplasmic organelles involved in the storage and regulation of triglycerides and cholesterol esters. LipidSpot™ dyes are fluorogenic neutral lipid stains that rapidly accumulate in lipid droplets, where they become brightly fluorescent. The dyes can be used to stain lipid droplets in both live and fixed cells, with no wash step required. Cells also can be fixed and permeabilized after staining. LipidSpot™ stains show minimal background staining of cellular membranes or other organelles, unlike traditional dyes like Nile Red. LipidSpot™ 488 has excitation around 430 nm, and can be excited equally well at 405 nm or 488 nm. 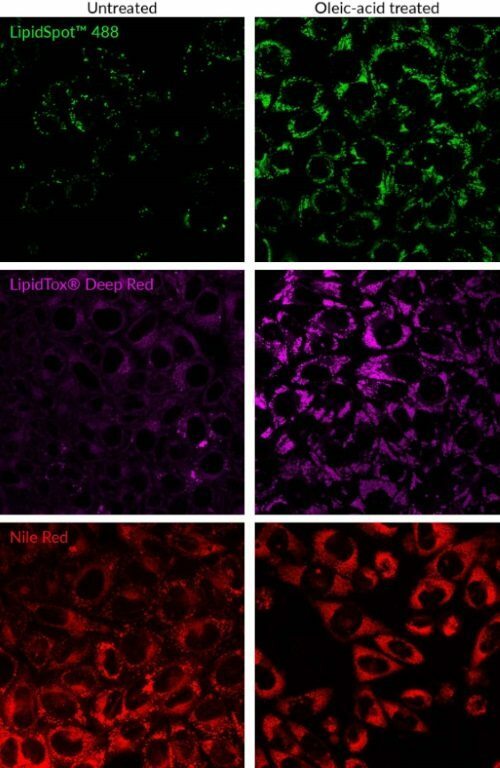 In cells, it stains lipid droplets with bright green fluorescence detectable in the FITC channel. LipidSpot™ 610 has excitation/emission at ~592/638 nm in cells; it is optimally detected in the Texas Red® channel, but is also bright in the Cy®3 and far-red Cy®5 channels. Therefore, we don’t recommend pairing LipidSpot™ 610 with other red or far-red probes. LipidSpot™ 488 stains intracellular membranes in yeast, but LipidSpot™ 610 does not. Both LipidSpot™ dyes can stain gram-positive bacteria, but not gram-negative bacteria. See our Cellular Stains Table for more information on how our dyes stain various organisms.